Discussion in 'The Lounge' started by eaterofdog, Mar 20, 2008. Dual disc brakes and new Fold On Impact Technology. I'd buy it if it was cheap on Craigslist. It's small enough to hide from my friends. Weird looking, but most foldies are. I'd ride it! Can you ride directly on the rotors? Take the wheels off and save some weight. Maybe put a little rubber on the edge of the rotor. 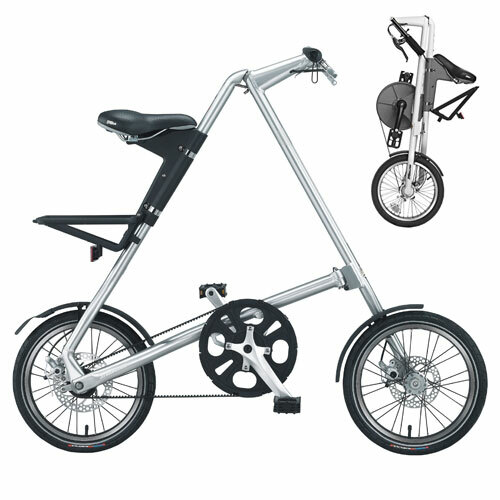 As much as I like to make fun of folding bikes I kinda like that one. It'd be cool to run a nexus 3spd on it...you'd have to loose the disk though if you did. Small wheeled bikes need bigger chainrings to acheive the same gear inches. That bike is cool. Way to think outside of the box. It'd be awesome if you took the train or BART to work. Total weight is only 20 pounds. Sounds like an XC race machine.